Who invented the Microwave Oven? The name of the person credited with inventing the Microwave Oven is Percy Spencer (1894 - 1969). Percy Spencer is not only famous as the American inventor of the Microwave but also as a physicist, entrepreneur and businessman. When was the Microwave invented? Percy Spencer invented the Microwave oven in 1945, during the WW2 (1939 - 1945) period of invention. The invention of the Microwave originated in America and is considered a useful addition to the field of Household Items. Definition of the Microwave: The Microwave is defined as the shortest of radio waves found in the non-ionizing portion of the energy spectrum. Microwaves can safely produce heat and not cause food to become radioactive. A microwave oven is activated when an electric current causes a magnetron to emit a beam of microwaves that are distributed throughout the unit by a rotating reflector. The microwaves agitate water molecules in the food which generate enough heat to cook it. Fact 1: Who invented the Microwave? 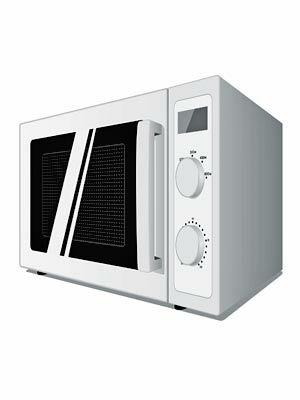 The Microwave ovenwas invented by Percy Spencer in 1945 during the WW2 (1939 - 1945) era of inventions. Fact 2: Who invented the Microwave? Prior to the invention of the Microwave oven in 1945, conventional types of cookers and ovens were the primary way to cook food during the modern era. Fact 3: Who invented the Microwave? Before the microwave oven was invented, scientists invented magnetron, a tube that produces microwaves, during WW2 (1939 - 1945). Magnetrons were used in the British RADAR system in order to spot Nazi warplanes on their way to bomb the British Isles. Fact 4: Who invented the Microwave? Purely by accident it was discovered that microwaves could also cook food and the microwave oven was invented in 1945. Fact 5: Who invented the Microwave? The inventor of the Microwave oven, Percy Spencer, was born on July 19, 1894 in Howland, Maine, United States and died on September 8, 1969. Fact 6: Who invented the Microwave? The early years of Percy Spencer were spent in Howland, Maine, United States where he was raised by his family. Percy Spencer was educated at a grammar school, but was forced to leave school early in order to earn a living. Fact 7: Who invented the Microwave? Following his education his first job was working in a local paper mill where, despite his total lack of training or experience, he became involved in the installation of electricity. Fact 8: Who invented the Microwave? Percy Spencer was horrified by the sinking of the Titanic in 1912 but admired the efforts of the wireless operators aboard the ship. At the age of 18, Percy Spencer decided to join the U.S. Navy, keen to learn about wireless communications. Fact 9: Who invented the Microwave? Percy Spencer was not given the opportunity to learn about wireless communications directly so he spent all his spare time learning about the subject. He was therefore a self-taught man who went on to learn about calculus, chemistry and physics and became an expert in radio technology. Fact 10: Who invented the Microwave? In 1925 Percy Spencer joined a newly formed company in Cambridge, Massachusetts as an engineer. It was called the Raytheon Manufacturing Company, which became a major U.S. defense contractor. Fact 11: Who invented the Microwave? Percy Spencer became a member of the management team and whilst producing vacuum tubes began experimenting with microwave tubes. Fact 12: Who invented the Microwave? Robert Watson-Watt invented Radar in 1939 at the start of WW2 but as the war progressed, Britain was unable to mass-produce the tens of thousands of magnetron tubes which were at the heart of radar’s function. Fact 13: Who invented the Microwave? At the suggestion of MIT’s Radiation Laboratory, a meeting was arranged between British scientists and Raytheon engineer Percy Spencer. Impressed with the Raytheon company and Percy Spencer the British awarded a contract to Raytheon to supply the magnetrons. Fact 14: Who invented the Microwave? Raytheon became the major Allied supplier of magnetrons during the war years and Percy Spencer became an expert in the field. He was awarded the Distinguished Public Service Award for his work, the highest honor the Navy bestows on civilians. Fact 15: Who invented the Microwave? The invention of the Microwave oven happened completely by accident at the end of WW2. Percy Spencer was working in the radiation laboratory at Raytheon on active Radar equipment and suddenly noticed that the candy bar he had in his pocket had suddenly melted - the microwaves had heated the chocolate. Curious about the effect he decided to experiment further and tested the effect on unpopped kernels of corn. To his delight and surprise they began to pop! Fact 16: Who invented the Microwave? Percy Spencer began conducting research and additional experiments into the effects of microwaves on food. The results were exciting and positive, microwaves cooked food. He discovered that Microwaves were absorbed by water, fats and sugars and immediately converted to heat, cooking food quickly (much faster than conventional ovens) and evenly, without heating dishes made of plastics, glass or ceramics. The type of radiation emitted by microwave ovens is non-ionizing, so did not present any form of danger to people. Fact 17: Who invented the Microwave? The microwave oven was a relatively simple device consisting of a magnetron hooked up to a high voltage source. The magnetron directed microwaves into a metal box which bounced around converting microwave energy into heat and cooking food without effecting dishes. Fact 18: Who invented the Microwave? On October 8, 1945 Percy Spencer and Raytheon filed for a US patent for a "Method of treating foodstuffs" and added "and more particularly to the cooking thereof through the use of electromagnetic energy". The patent was granted number US2495429 A. Fact 19: Who invented the Microwave? Once the patent for the invention of the Microwave oven had been granted Raytheon began work on creating a commercial microwave oven. The product, called the "Radarange" was launched in 1947. Fact 20: Who invented the Microwave? The first Radarange was extremely expensive with a price tag of $3,000. The Radarange was 6 feet tall and weighed around 750 pounds. Too expensive and too bulky for home use and was initially used in restaurants, railways and on ships. Fact 21: Who invented the Microwave? It was many years before the microwave oven would become commercially viable for home use. The first microwave for home use was launched in 1967, cost $495 and was small enough to be fitted on a kitchen counter top. Who invented the Microwave? Percy Spencer died on September 8, 1969 at the age of 77. Although he held over 300 patents he will always be remembered as the inventor of the microwave oven. Fact 22: Who invented the Microwave? The first microwave ovens were referred to as "electronic ovens", they were not called microwave ovens until the 1970's. The microwave oven can now be found in millions of kitchens all over the world.